SEOUL, Nov. 6 (Yonhap) — With the South Korean baseball’s championship series deadlocked at one game apiece, it will be a battle of right-handers on the mound in Wednesday’s Game 3. The Doosan Bears and the SK Wyverns have split the first two games of the Korean Series over the past two days. The Wyverns won the opener by 7-3 on Sunday on the road at Jamsil Stadium in Seoul, and the Bears avenged that loss with a 7-3 victory of their own the following day. The best-of-seven series will now move to the Wyverns’ home, SK Happy Dream Park in Incheon, just west of the capital, for the next three games starting Wednesday. And the Bears, the regular season champions seeking their third title in four years, will send right-hander Lee Yong-chan to the mound. The 10-year veteran was back as a full-time starter for the first time since 2012, and the transition from the bullpen was a major success. Lee went 15-3 with a 3.63 ERA, ranking inside the top five in both wins and ERA. He will be making his eighth Korean Series appearance but his first start. In those seven previous games in relief, Lee recorded one save and had a 1.86 ERA. The Wyverns, chasing their first title since 2010, will send American right-hander Merrill Kelly for Game 3. In his fourth season in the Korea Baseball Organization (KBO), Kelly went 12-7 with a 4.09 ERA, including a 6-2 record and a 2.78 ERA after the All-Star break. This will be Kelly’s first Korean Series appearance. 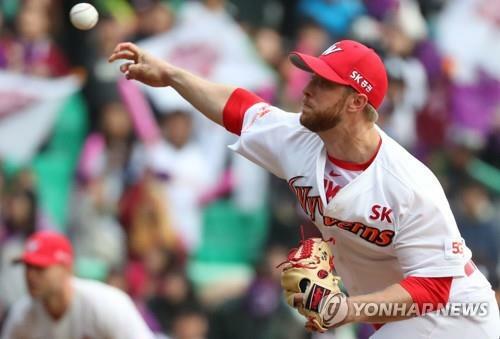 Kelly made a relief appearance last Friday in Game 5 of the previous playoff series against the Nexen Heroes. He threw 2 2/3 innings and gave up five runs — three earned — on five hits. Lee struggled against the Wyverns this year, with a 1-1 mark in three starts with a 5.68 ERA. Kelly went 3-1 against the Bears with a 3.03 ERA in the regular season. The Wvyerns led all teams with 233 home runs in the regular season, and three hitters went deep once each against Lee: starting outfielder Han Dong-min, starting infielder Jamie Romak and backup infielder Choi Hang. Of the three, Han has a home run in this series. From the Bears, catcher Yang Eui-ji went 4-for-11 with a home run against Kelly in the regular season. He has gone 3-for-6 with a pair of RBIs in this series so far. First baseman Oh Jae-il had five hits, including a home run, in 11 at-bats against Kelly in the regular season, but he has struggled in the Korean Series, with a 1-for-7 mark. He was lifted for a pinch hitter in the eighth inning Monday.